FFWPU Scotland: On Sunday, 5th July the Peace Road event in Scotland took place at the bridges over the Firth of Forth near Edinburgh. The 31 participants were mostly Scots or British, but there were also members from several other countries, including Korea, Japan, Germany, France, Italy, Austria and Russia. The weather forecast was for rain in the afternoon so we brought the event forward to the morning. Shortly after 10.30 a.m. we gathered in front of the high school at South Queensferry, sang a few songs, read a passage from True Father’s peace message in 2005 about the international highway and the Bering Strait King Bridge-Tunnel, and prayed. Meanwhile, the bicycle hire man arrived and fifteen of us received bicycles. 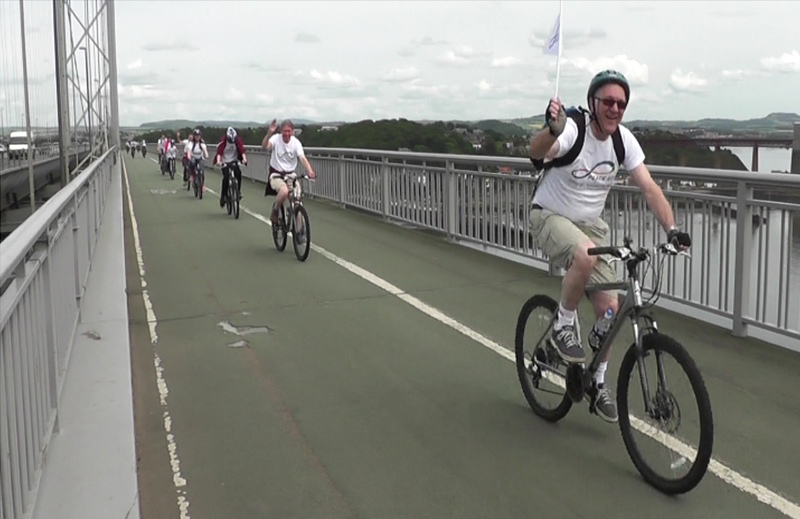 We set off on the path to the Forth Road Bridge, led by Oliver Lane, organizer of the event, along with the cameraman on a bicycle. At the same time the walkers, sixteen in number, set off down the hill to the South Queensferry quayside. Coincidentally, the Forth Rail Bridge, which is 125 years old, received UNESCO World Heritage status the very same day as our Peace Road event. All the bridges are over 2.5 kilometers (1.5 miles) long.